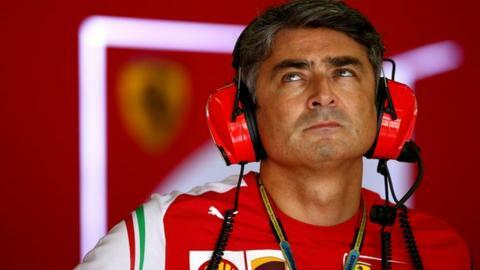 Ferrari have sacked Marco Mattiacci after just seven months in the role, with Maurizio Arrivabene succeeding him as team principal. The Italian outfit have endured another disappointing season, finishing fourth in the constructors' championship, behind Mercedes, Red Bull and Williams. Fernando Alonso has left the team to join McLaren, with four-time champion Sebastian Vettel moving into his seat. Arrivabene has spent the last 27 years with Ferrari sponsor Philip Morris. Maurizio Arrivabene is the third man to run the Ferrari F1 team this season and it comes after the Italian outfit ended the year without a race win for the first time since 1993. Ferrari finished fourth in the constructors' championship with 216 points, 485 behind champions Mercedes. "Throughout his time with Philip Morris, Maurizio Arrivabene has been closely involved in the partnership with Ferrari, both in Maranello and on the world's racing circuits," Ferrari said in a statement. "He has also represented all Formula 1 sponsors on the F1 commission since 2010." Italian Arrivabene, vice-president of global communications for tobacco giant Philip Morris, is also an independent board member of leading European football club Juventus, who currently top Serie A.
Mattiacci was handed the role of team boss in mid-April after Stefano Domenicali resigned following the team's poor start to the season. After Sunday's season-ending race in Abu Dhabi, Mattiacci admitted 2014 had been "a difficult season" but said work was under way to produce "a competitive car" that would turn Ferrari into title challengers again. Alonso and Kimi Raikkonen finished ninth and 10th in Abu Dhabi as Lewis Hamilton, driving a Mercedes, became world champion for a second time. Ferrari president Sergio Marchionne sent a letter to all employees of the F1 team following the announcement of Mattiacci's departure. He warned them that "the road ahead will be neither short nor easy" but that he had appointed Arrivabene because he "leads by his strong personal example, his professionalism and the integrity of his decisions". He asked the employees at the end of a tumultuous year that has also seen the departure of long-term president Luca Di Montezemolo, to "embrace change rather than be afraid of it". He added, in an apparent reference to the departure of Alonso, who lost faith that Ferrari could deliver him success in the near future: "We all know how important a healthy team spirit is. The kind of spirit that can only come from a group of people who believe strongly in a project and are prepared to share the commitment, sacrifice and results." It has been a year of revolution at Ferrari. Their worst season in F1 for 21 years has seen the departure of the president who has served for that entire period, the man many believe to be the finest driver in the world and two team principals. When Marco Mattiacci, the former head of Ferrari North America, was appointed in April following the resignation of Stefano Domenicali, he didn't feel like a long-term appointment but no-one expected him to serve just seven months. And the fact that this former protege of Fiat boss - and new Ferrari president - Sergio Marchionne has left the company altogether hints at some kind of cataclysmic internal falling out. There was widespread surprise in F1 over the Abu Dhabi weekend when the news of the appointment of Maurizio Arrivabene leaked. He has been involved for years in governance as a sponsors' representative on the rule-making F1 Commission and has long been close to Ferrari. But whether he will survive long or be successful as Ferrari team principal remains to be seen. When Fernando Alonso made his decision to leave in September, many questioned his thinking. It seems more understandable now.